One step below the Jagdpanther it sometimes has the ability to bounce shells from its highly angled front armor. 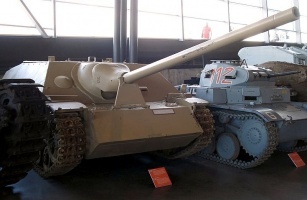 Which is a blessing for it as, unfortunately, the Jagdpanzer IV has bad starting guns for its tier and you must invest in the tracks before you can mount anything else. However one way to sidestep a 4000 exp grind to the tracks is investing 200k for the enhanced suspension equipment which increases the load limit of the tank by 10%. For these reasons, it is widely considered the worst tier 6 TD. Fully upgraded, it's almost as fast and mobile as the StuG III while having about double the HP and has a small target silhouette as well as similar camo values to its predecessor. It is important to note that with the new and improved L/70 (since the 8.0 conversion) this tank has become a contender for its tier. No longer can this be considered a bad tank destroyer - though it might have the same gun as the StuG III, it has a marked improvement in armor, health, speed and rate of fire, making for a more dangerous target that stays at range. Vulnerable engine, will break often from frontal shots. The JagdPanzer IV is widely considered the worst Tier 6 tank destroyer because of its lacking role as a sniper in game, on top of the fact that the suspension MUST be researched and equipped to the tank before adding anything else to it. 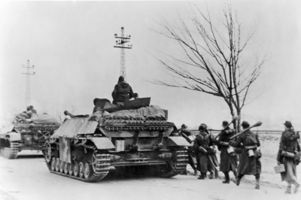 The Jagdpanzer IV's guns are obsolete by any standard, seeing as they are used by all of the Tier 6 mediums of the German tech tree. However, unlike the mediums, it has a high rate of fire (11.17 RPM with 8.8cm, 15.91 RPM with 7.5cm L/70) which if used correctly, can absolutely shred tanks. This vehicle is also tied with the StuG III and Hetzer for one of the best camo ratings in the game, making sneak attacks quite possible. As stated above, its stock gun is miserable as are the majority of the ones available for research; underpowered and lacking penetration with decent rates of fire, get used to shooting a lot, and bouncing a lot, especially in higher tier matches, which you will most certainly be a part of as a tier 6. One thing to note however is that if flanking is possible in this tank, it should not only be considered an option, but a necessity. This is where the JgP IV truly shines. By minimizing your weaknesses (penetration) and attacking from the flanks, you can seriously threaten the enemy. This tank destroyer excels very much as an Assault gun, not a sniper. So instead of sitting on a hill with this tank, use your speed and mobility to keep up with friendly tanks and provide them with supporting fire to help their advance. Only when you know you will be able to pen enemies from your position should you stay stationary. Another key element of being an ambush DPM TD is defending losing flanks. Utilize the tanks mobility to re-position to ambush enemy tanks pushing a flank. This should give you a first strike advantage, and possibly a health advantage, giving your allies were able to do something before falling. Few tanks of the same tier can deal with multiple targets and stay nearly invisible to the enemy. Giving your in a position to pen the enemy targets, the enemy has few to no options left. Overall, the decent damage and good ROF, paired with the low armor penetration, creates a lot of all-or-nothing scenarios where the JgP IV either does extremely well and carries the team, or contributes very little for a TD of its tier. With the 8.8, the playstyle is much like the Hetzer, but with a bigger and faster tank, and relatively less armor. The previously stated tactics are applicable to the 8.8 cm PaK 36 L/56. 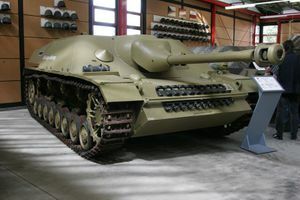 However, what hasn't been explained so far is the tactics for the 7.5 cm L/70, used from the StuG III. Although it is the same gun used in the previous tank, it gets a serious Rate of Fire (and consequently DPM) buff. Additionally, it is mounted on a much more capable chassis with higher armor values, more speed and nearly double the HP values. Used by a skilled player, one might question why there is such a bias against a very capable tank. Using the L/70, one may take a more traditional TD role, and play the tank to its biggest strengths, without getting dangerously close to the front line. With the high accuracy of the L/70, one may target specific areas of tanks, such as the tracks - even at range. This tactic will allow a player to remain at least 100m away from the enemy at all times - easily done in combination with mobility. Additionally, what isn't immediately obvious is that the Jagdpanzer has a very good camo value and when properly hidden (remaining far enough behind bushes that any shot will not break camo) can lay on the DPM from afar without any risk of return fire. Using the L/70 and a gun rammer, the JagdPz IV becomes almost like a tier 6 E-25, with a very fast firing gun, good speed and camo values. Don't be afraid to trade with the enemy, even if they have big guns. With either gun, but especially the L/70 (due to the lower frequency of unfortunate bounces and weird misses), you can take hits to your decently large HP pool/sloped armor and you will have higher DPM than any enemy you face - letting you win fights through sheer attrition. This is something the StuG III couldn't do. However, do remember to only resort to this tactic when absolutely needed, as in self defense situations. Otherwise, staying hidden is key. Like any tank, you'll want to research the suspension first. It might even be a good idea to save up some free experience after researching the JagdPz IV and researching the suspension before you buy it (or mount enhanced suspension equipment), because the stock gun is very underpowered. After that, the 7.5cm L/70 already carries over from the StuG, so equipping that to your tank will be very beneficial. The next thing to research is the engines, which have a very low research cost. After that, all that's left to research is the guns and the JagdPanther.